(a) Before installing the front seat outer belt assembly, check the ELR. (1) When the inclination of the retractor is 15° or less, check that the belt can be pulled from the retractor. 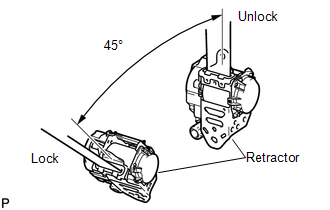 When the inclination of the retractor is over 45°, check that the belt locks. If the result is not as specified, replace the front seat outer belt assembly.